Kids also benefit tremendously from �compound growth�. During the last 80 years, the stock market has doubled every seven years for an average of 8% growth per year. If those averages continue into the future, a kid's investment will double EIGHT times between age 9 and 65 � seven times between age 16 and 65. A couple years ago, Jeff Schnepper gave the following example on MSN Money: if a kid invests $4000 each year in a Roth IRA between the ages of 7 and 18 (and nothing more thereafter), by age 65 that investment would be worth 2.4 million dollars. The compounding that takes place during the last seven-year period adds $1.2 million of that amount. In other words, if the kid had started those investments seven years later, they would have $1.2 million less at retirement age. The above example of a kid investing $4000 per year may not be realistic, but the following one is much more achievable. If you open a Roth IRA with an initial deposit of $600, and then add $50 per month, with annual interest of 10% (compounding monthly), at the end of 50 years you will have a balance of $953,441 -- $922, 841 of which comes from compound interest. Consider that your total investment � spread over 50 years -- is just $30,600 � the price of a new car today and the cost of buying that new car will be spread over a much shorter time frame. This is an optimum and hypothetical example of compound interest (and actual experience will be different). However, this is a powerful illustration of compound interest and the importance of starting an investment program early. If, in the above example, the investment period is shortened just 1 year -- to 49 years, the account would total only $862,498 -- $90,943 less. On the other hand, if you extend the investment period to 60 years (not unrealistic for a kid between the ages of 9 to 12), your total is $2,591,247.93 � and your actual investment is $36,600, spread over 60 years. This is the power of compound interest. Think what your total could be if you added more than $50 per month!!!! And remember, if this investment and growth is in your Roth IRA, all that compound interest is tax free. 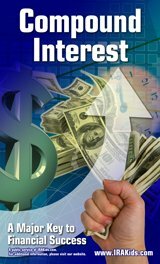 If you want to explore other compound interest growth options, please see the Compound Interest Calculator that was used to produce the above examples. 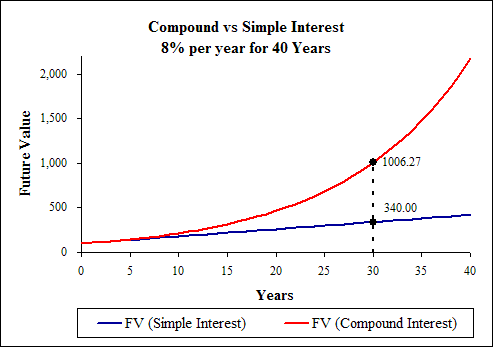 The chart at right showing the difference between Compound and Simple Interest is from the Time Value of Money Website, from which you can download an Excel spreadsheet to chart different interest rates and time periods.